Being a parent is hard! Teaching children all they need to know to succeed in life is a big task. You don't have to take it on alone. Our 202: Parenting class will teach you the basics of parenting. It has been referred to as the "long lost handbook" of raising children. Recommendation: After taking the 101 class enroll yourself and spouse for the parenting class. The best way to learn is to teach. 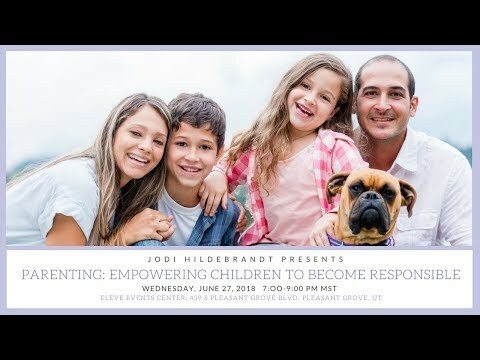 You may have missed the live event however it's never too late to watch and learn from Jodi Hildebrandt in live action! Connection is the central spiritual and emotional need of every human being. Connection is an outcome of being impeccably emotionally honest, assertive, responsible, humble, transparent, open, and vulnerable. It means taking risks, sacrificing, and genuinely validating others. Calm, peace and empathy are the outcomes of a lifestyle of connection. Children who pursue this course become conscious of—and can challenge—their distorted thoughts, false beliefs, fears, addictions, lusts and selfishness, and find the fruits of love, empathy, intimacy, compassion, personal empowerment, spiritual freedom, and connection. However . . . connection is difficult to maintain because of our human tendency to react in distorted thoughts and deny pain / vulnerability (attempt to control things, people, and/or self). Children need awareness—logical, spiritual and emotional. They are watching and engaging with people and things around them, and when those “things” and experiences are pleasant or give them an outcome that they deem as desirable, they will continue to engage the experience or activity. They are not thinking about Truth or distortion. That’s where you come in—your responsibility as an adult in their world is to teach them morality, ethics, connection, vulnerability, validation, manners, compassion, boundaries, politeness, awareness—all the characteristics that support a child to be whole, refined, sophisticated (emotionally, mentally & spiritually) and joyful. You also are responsible to teach them about distortion and when they are in distortion, so they can recognize the outcomes that happen when they (or others) choose to stay in distortion. Through the RAISE process you will begin to share and teach children how and why they choose distortion. The RAISE process is a skill set that teaches you to manage your emotional life and teach (your) children to do the same. Children need to be instructed that the pain (optional) that exists in their life is because of their misinterpretations of Reality / Truth. This skill will gradually free children of the mistaken conclusion that others are responsible for their emotions, thoughts, or behaviors—or that they are responsible for others’. As you are consistent with them in developing this skill, distorted thoughts / false beliefs will become more obvious to them (and you), giving both of you the opportunity to respond (be conscious and engage) instead of reacting (“knee-jerk” / unconscious). Your children NEED your support and steady awareness to identify their distorted thoughts and false beliefs. Distorted thoughts and false beliefs invite them into a place of blame, comparison, isolation, and disconnect. Identifying distorted thoughts and false beliefs invites them into healing, new awareness, personal responsibility, vulnerability, and connection. Drama is the emotional / physical manifestation that you have disconnected from Reality / Truth and are in distorted thoughts and the Paths to Pain. Drama is an unsophisticated and uneducated attempt at connection – it is a tortured attempt to be heard, seen and validated, which produces additional distorted thoughts and false beliefs, and perpetuates disconnection. At the heart of drama is dishonesty – you deny your real feelings (you go into denial), hiding them from yourself and others, and robbing yourself of real connection. The outward skills and inward choices and actions of self-care are vitally important—in a very real sense, self-care habits keep you alive both physically and spiritually. And, your motives for choosing to care for yourself are equally important. Motives are the central hub—the “nerve center”—that produces your every thought, word and choice. Your motives are either in Truth or distortion, and therefore you can choose to care for yourself in Truth (Truthful motives), or not care for yourself in distortion (distorted motives). Consistent self-care, if done in honesty and responsibility, will continuously move your motives towards greater Truth and less distortion. The motivation to self-care must come from each individual. Nobody can do it for you, and you cannot do it for your children—they must learn (and it’s our responsibility to teach them how) to care for themselves. We each choose whether or not to self-care, how we self-care, why we self-care. 5. Create and hold boundaries with yourself and the other person as you move towards surrendering. 6. Surrender: past or present grievance / conflict / trauma.